Slice chicken breasts in half horizontally to create 8 thin pieces. Mince shallot and garlic, slice lemon, and chop parsley. Heat grill to medium-high heat and brush with a little oil if needed. When hot, grill chicken, turning once, until cooked through, approx. 5 min. per side. Meanwhile, heat olive oil in pan over medium heat. Add garlic and shallot and cook until fragrant, approx. 2 – 3 min. Turn heat up to medium-high and add wine. Simmer for another minute, then add chicken broth. Whisk flour into the pan until smooth and continue to cook another couple of minutes until thickened. Add lemon juice, capers, and butter, and mix until butter is melted. Adjust seasonings to taste. 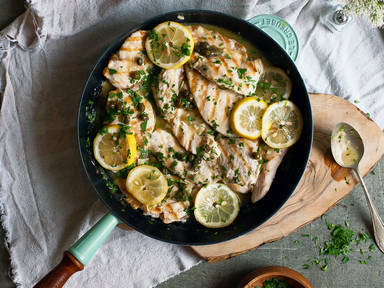 When chicken is ready, pour sauce over it, sprinkle with parsley, and top with lemon slices. Enjoy!